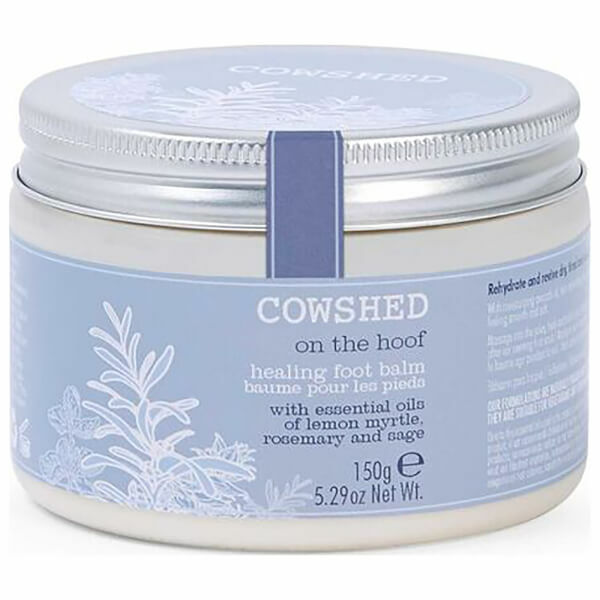 Treat cracked, hard skin on the feet to Cowshed's On the Hoof Healing Foot Balm; a fast-absorbing, non-greasy formula developed using the finest natural ingredients to soften and moisturise. 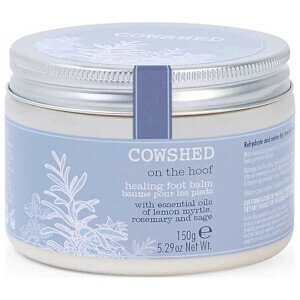 Harnessing the nourishing powers of Shea Butter, Avocado Oil and Aloe Vera, the rich balm revitalises dry, aching feet, whilst delivering an uplifting fragrance blended from Grapefruit, Clary Sage and Rosemary Essential Oils. Deodorising Echinacea leaves feet feeling and smelling great all day long. Massage into the soles, heels and balls of your feet until absorbed. For best results use before bed to allow the balm to work its magic overnight. Aqua (Water/Eau), Glycerin (Vegetable), Cetearyl Alcohol, Prunus Persica (Peach) Kernel Oil, Triticum Vulgare (Wheat) Germ Oil, Butyrospermum Parkii (***Shea) Nut Butter, Glyceryl Stearate, Persea Gratissima (Avocado) Fruit Oil, Menthyl Lactate, Zinc Ricinoleate, Cetearyl Glucoside, Limnanthes Alba (Meadowfoam) Seed Oil Cocos Nucifera (Virgin Coconut) Oil, Aloe Barbadensis (***Aloe Vera) Leaf Extract, Echinacea Purpurea (Echinacea) Flower/Leaf/Stem Juice, Powder Zingiber Officinale (Ginger) Root Extract, Tocopherol (Vitamin E), Sodium Hyaluronate, Benzyl Alcohol, Dehydroacetic Acid, Potassium Sorbate, Sodium Benzoate, Xanthan Gum, Sodium Lactate, Sodium Pca, Sodium Glycolate, Sodium Citrate, Sodium Malate, Lactic Acid, Glycolic Acid, Malic Acid, Citric Acid, *Backhousia Citriodora (Lemon Myrtle) Leaf Oil, *Citrus Nobilis (Mandarin Red) Peel Oil, *Citrus Grandis (Grapefruit) Peel Oil, *Pimenta Acris (Bay) Leaf Oil, *Rosmarinus Officinalis (Rosemary) Leaf Oil, *Salvia Sclarea (Clary Sage) Flower Oil, *Salvia Officinalis (Sage) Leaf Oil, *Boswellia Carterii (Frankincense) Gum Oil, *Eugenia Caryophyllus (Clove) Bud Oil, *Piper Nigrum (Black Pepper) Fruit Oil, **Limonene,**Linalool, **Geraniol, **Citral, **Eugenol, **Isoeugenol. *Natural pure essential oils. **Potential allergens. ***Certified organic ingredients.